It may not seem intuitive to tote hiking shoes and a cooler on a tour of art galleries, but that’s exactly what you should do when taking in the offerings along Scenic 276 Arts Corridor in Transylvania County. The 13-mile winding ribbon of highway that stretches from Brevard to the South Carolina state line could be tackled in a few hours, but it’s worth spending a full day. About six galleries, several spots to rest and refuel, and scenic points of interest await. Before setting out, head to Food Matters Market in Brevard for picnic provisions. Save room in the cooler, because you won’t want to pass on the fresh offerings at Whistlestop Market. Or forego the cooler, and plan to grab lunch at Cedar Mountain Café, where salads, sandwiches, and burgers are made from farm-raised proteins and local produce. For your artistic quest, don’t miss a visit to Duckpond Pottery, housed in a rustic ivy-covered building and featuring the work of Nick Friedman. In the small gallery, face jugs sit alongside functional pieces and sculptural pit-fired works. Take a tour to see Friedman’s hand-built train kiln, and then ponder your purchase on the large deck overlooking the French Broad River. Twice a month, it doubles as a stage when Friedman hosts free concerts. A quick skip down the road is Mountain Forest Pottery, housed in a late-19th century pebbledash farmhouse. Two floors showcase paintings, woven quilts, and more, but the bulk of the display is the work of potter Mary Murray and her late husband, Tim Murray, revered for his longtime role as head of Brevard College’s art department. Next is Mud Dabbers, and if you haven’t made a purchase by now, this is the place. 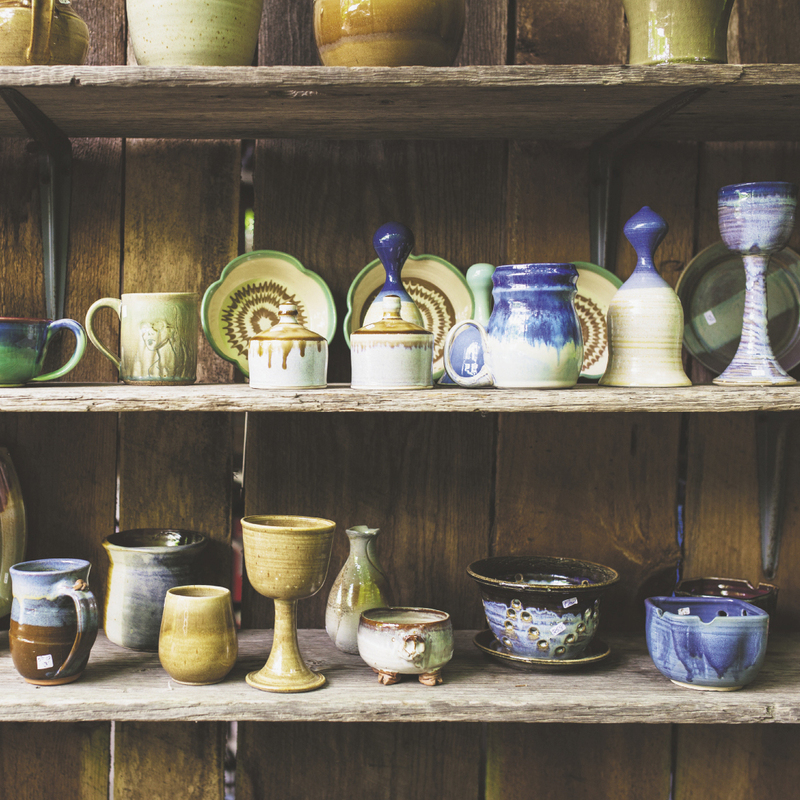 You can peek into the studio where owner John Dodson and other local potters exhibit the process, then step inside the old general store to shop for works by more than 25 ceramists. While pottery reigns supreme along the arts corridor, there’s also colorful works by Misty Mountain Glass, photography by Rob Travis at Blue Moon Gallery, and paintings by Sue Byrne Russell at Hemlocks Studio. And since you’re in the appropriately dubbed Land of Waterfalls, spend the afternoon exploring the cascades at DuPont State Forest. Or, if you’re short on time, head over the border to the overlook at Caesar’s Head State Park. It’s an easy walk to the view, where some 2,000 feet below marks the divide between the Blue Ridge Escarpment and the Piedmont. For a map, details, and contact info, visit www.scenic276arts.com or stop by the Brevard Visitors Center at 175 E. Main St. for a brochure.